Book Review: “Hollywood Worldviews” by Brian Godawa | J.W. Wartick -"Always Have a Reason"
I often say that every movie has a worldview. The same is true for any story. Brian Godawa’s book, Hollywood Worldviews: Watching Films with Wisdom & Discernment , takes just such an approach to movies: what do films teach us? How might we critically evaluate movies? First, Godawa introduces the concepts of a “cultural glutton” as opposed to a “cultural anorexic.” The point is that Christians are to be in the world not of it. It is one thing to say that violence in a movie is bad; but what of the context of the violence? The Bible also has many scenes which, if filmed, could even rate NC-17. The question is: what’s the point? When looking at film, Christians should look into the way the narrative shapes what happens in the movies. In order to look into this theme, Christians must be equipped to seek out the context of stories as well as the explicit (and implicit) things they teach. In order to equip people to watch film critically, Godawa approaches this task is divided among several chapters by topics related to film and worldview. Each chapter begins with a summary of the topic of the chapter and how one might discover this theme in film. For example, in the chapter on “Postmodernism,” he begins with a definition and explanation of the concept. Then, he utilizes a slew of examples from various movies to show how postmodernism is found in them in either positive or negative light. The chapters all cover interesting topics, and Godawa’s use of specific examples from movies are fantastic case studies for showing how critical engagement with worldviews can play out. Even better, Godawa’s explanations and applications could easily be used to apply outside of film and in areas like literature. Frankly, some of Godawa’s evaluation of popular films–including some I’ve enjoyed greatly–have forced me to rethink how I thought of the storyline. Movies which may appear to be fairly neutral or simply entertainment alone do indeed have their own way of approaching reality. Some of the movies which were brought to new light for me included “Gladiator,” “The Truman Show,” and “Groundhog Day.” Dozens of movies are treated throughout this book, and Godawa’s analysis is always interesting and thought provoking, encouraging the critical engagement he seeks. Another great aspect of the book are the activities Godawa proposes for each chapter to apply what one has learned. These are frequently interesting and provide ways forward to put into practice the art of discernment when it comes to watching film. One difficulty with a book like this is there is some necessary oversimplification. For example, Godawa, in his discussion of existentialism, writes: “Existentialism accepts the Enlightenment notion of an eternally existing materialistic universe with no underlying meaning or purpose” (95). Oddly, Godawa seems to downplay Kierkegaard’s very explicit Christian faith in light of his existential views, and Kierkegaard seems to become a kind of pariah through this analysis. Kierkegaard, for Godawa, is strangely aberrant from his general picture of existentialism as necessarily godless and without purpose. At other points, films receive short shrift are are discussed in ways which seem a bit odd. Of course, engagement with these points actually encourages the sort of critical interaction Godawa is pursuing. Some offhand comments are a bit awkward and out of place (for example the bare assertion that “men are the leaders in home and public roles” in Christianity without qualification–in contrast with the declared equality of genders in Galatians 3:28 and the apostleship of a woman in Romans 16:7), but overall these negative points are outweighed by the service Godawa has done to provide critical perspective on worldviews in film. 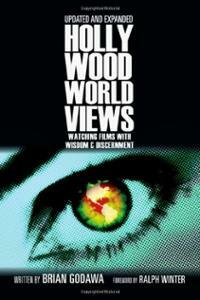 Hollywood Worldviews is a great book which will encourage much discussion. It would serve as a good resource for those who wish to meaningfully engage the culture. People who read it will be equipped to have thoughtful conversations on the way movies put forth worldviews. The book should come with a warning, though, some of your favorite movies may not be what they seem! Brian Godawa, Hollywood Worldviews: Watching Films with Wisdom & Discernment 2nd Edition (Downers Grove, IL: InterVarsity Press, 2009). I really enjoyed reading the first edition of this book several years ago. If only more Christians would take a worldview lens when discussing movies with their friends; they provide such a touchstone for truth revealed through narrative. I agree. I think that we really need to be reflective when we watch movies and look for the truth therein, while also being ready to critique the untruths also revealed. Every movie has a worldview. I think it actually makes it more fun to be more reflective about movies also. Have you read Meaning at the Movies by Grant Horner? I have not. Did you enjoy it?